Grind tomatoes, ginger, salt, coconut, rasam powder, and tamarind (if using) to a fine paste. Transfer this ground paste to a medium size pan, add water and curry leaves. If using jaggery, add it now. 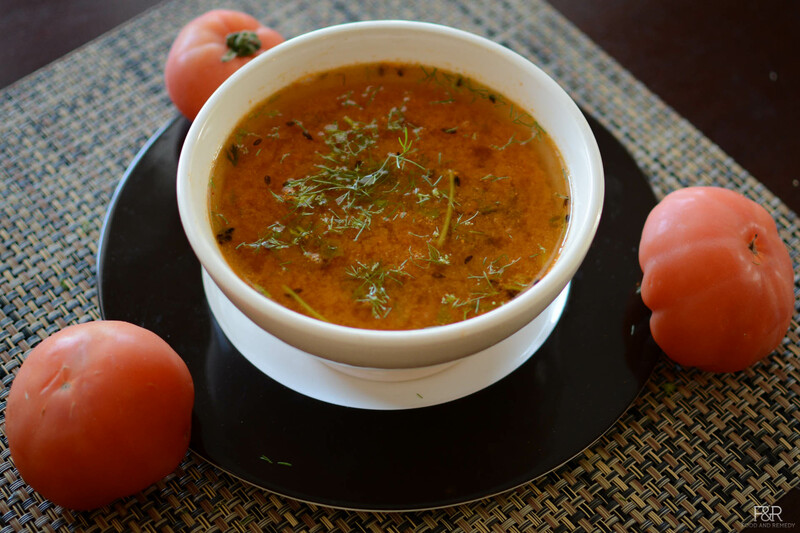 Boil this on a medium-low heat for 6 to 8 minutes or until you get a beautiful froth on the top of the rasam. Now turn off the heat and garnish with chopped cilantro. Heat the ghee in a ladle on a medium heat. Once the ghee is hot enough, add hing, mustard seeds. When the mustard seeds pops add jeera and let it pop. Hi ..I love your recipes..in the above rasam recipe..the instructions skipped the step of adding rasam powder to the ground tomato paste..